Portland is famous for its local breweries and bike-friendly streets. This cycling tour allows you to experience both as you pedal through downtown, stopping to sample craft beers at two carefully selected breweries (own expense). Get some exercise and avoid the hassle of driving as your guide leads you through the city. Bonus: receive a tasty pint and souvenir pint glass at tour’s end. Your beers and bike tour begins at Cycle Portland Bike Tours and Rentals in downtown Portland, where you meet your guide and pick up your bike, helmet, and rain gear (if needed). 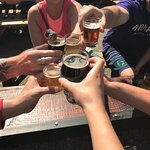 Then, hop on your bike and pedal to two different breweries, each only a short ride apart, where you get to experience Portland’s craft brewing scene firsthand. Food and beverages are not included at these stops, so you can choose how many samples of local Pacific Northwest beers to enjoy. End your ride back at the bike shop, where you can sip a complimentary pint provided by Hopworks Urban Brewery. Remember your trip with a souvenir pint glass. Great Shop. Great Bikes. Great Tour. Even Greater People! The only draw back is the large population of semi-aggressive and obnoxious homeless people in downtown Portland. But I highly recommend this ride. Get quick answers from Portland Breweries By Bike staff and past visitors.